Making a rainbow pony bead prism suncatcher is an easy craft for both kids and adults. The beads are strung in a rainbow of colors and the prism will cast beautiful rainbows all over the room when the sun hits it. Kids can learn their colors and practice their fine motor skills while doing this simple craft. When paired with rainbow science putting one of these together becomes a fun STEAM activity for kids. Please don’t offer this craft to youngsters that are still mouthing objects or are not ready to handle small parts or plastic needles. The size of the pony beads presents a choking hazard to children 3 and under. These make wonderful gifts for friends and family. They also make a great decoration or favor idea for a rainbow birthday party. Putting one of these together requires simple engineering and easy math skills. Click on the link to learn how to turn this craft into a rainbow science STEAM activity for kids. Prism(s) – We used these Crystal Teardrop Prisms , or you can use Crystal Ball Prisms , or Icicle Crystal Prisms. 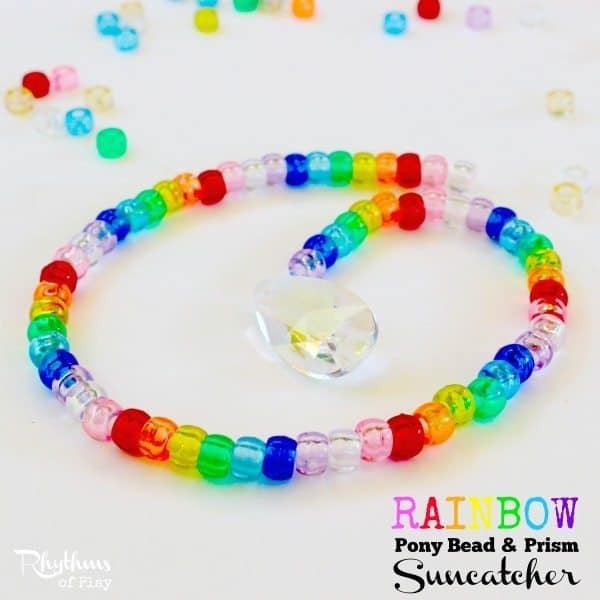 There are two ways to prepare to string a rainbow pony bead prism suncatcher. Click on the links below to see which way would work best for you or your child. Pony Bead and Prism Suncatchers – For young crafters with beginning fine motor skills. Explains how to teach a young child to use a needle to string the beads. Heart Prism Pony Bead Suncatcher – For crafters with advanced fine motor skills. Explains how to use crimping pliers to put this simple craft together. 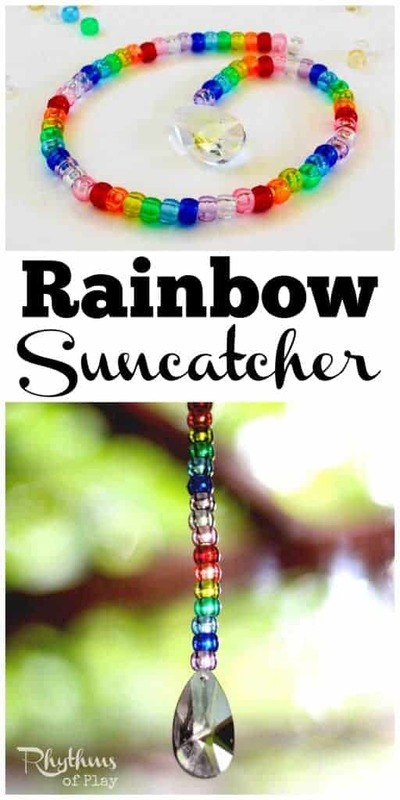 Use the directions on one of the projects above to make a rainbow pony bead prism suncatcher. Create a rainbow using colors in the order that you prefer. One way to create a rainbow pattern can be seen in the photos below. Identifying and creating patterns is an easy way to explore beginning math concepts. 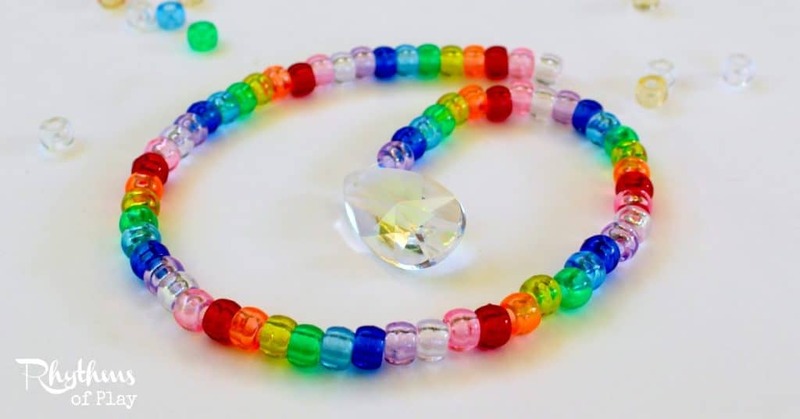 Allow your child to play around with different rainbow patterns and ways to string a rainbow. Making a rainbow pony bead and prism suncatcher is a fun fine motor craft for kids and adults of all ages. Putting one of these together is a great teaching aid. For tips on how to turn this into a STEAM activity click on the link. Suncatchers made out of beads in a rainbow of colors look gorgeous in any window. The prism will cast beautiful rainbows all over the room when the sun hits it. These would make a great decoration or favor idea for a rainbow birthday party. This DIY craft project also makes a wonderful gift idea for Christmas, birthdays or any other occasion! Thanks Emma! I have been making suncatchers with prisms in many ways ever since I was a child. I have always loved the rainbows that they cast around the room when the sun hits them. It was always a magical time!